A few weeks after winning Brabantse Pijl, Ben Hermans (BMC) again confirmed his excellent condition when he took a hugely impressive solo victory in the final stage of the Tour de Yorkshire. The Belgian attacked form a reduced 17-rider peloton with 12km to go, passed lone leader Lawson Craddock (Giant-Alpecin) and held off his chasers before Greg Van Avermaet beat Julien Simon (Cofidis) in a sprint to make it a 1-2 for BMC. Lars Petter Nordhaug benefited from a great ride by Team Sky to take the overall victory in the inaugural edition of the race. For several years, Ben Hermans has been known as the loyal domestique who has been riding strongly for his captains in the mountains and the Ardennes. The Belgian has rarely got a chance to race for himself and so he started the 2015 season without a single victory on his palmares. However, Hermans has managed to turn things completely around in the last few weeks as he has used a combination of great legs, wise tactics and strong captains to come away with two victories. A few weeks ago he won the Brabantse Pijl classic and today he added the Tour de Yorkshire queen stage to his growing palmares. In the Belgian race, Hermans had attacked strongly early in the race and while everyone was looking at his captain Philippe Gilbert who did an excellent job to cover moves, he narrowly held off his chasers to take a solo win. Today he used a similar plan to take his second big win. The queen stage was held in the hilly Yorkshire terrain and included several short, steep climbs that took their toll on the riders. BMC went into the stage with Greg Van Avermaet as the big favourite while they also looked for an opportunity for Samuel Sanchez to take the overall win. The latter plan quickly faded as Sky really played with the muscles and set a very fast pace that made it impossible for anyone to attack. Hence, it was a small 17-rider group that crested the summit of the final climb with 24km to go and Hermans found himself there with several teammates at his side. Sanchez and overall leader Lars Petter Nordhaug sprinted for the bonus seconds behind lone leader Lawson Craddock and chaser Nicolas Edet (Cofdis) at the top of the small climb and that ascent had been hard for Sky. They had to use a lot of energy to bring back Edet and a strong move from Stephen Cummings (BMC) and Steven Kruijswijk (LottoNL) in the subsequent section and so they were left a bit empty when the catch was made with 12km to go. This was the perfect opportunity for Hermans to go on the attack and he quickly got a big gap when he made his move. Sky were content with the overall victory and so had no interest in bringing the BMC rider back. As the British team, BMC and Cofidis were the only riders with more than one rider in the group, things were looking good for the Belgian. Edet briefly tried to work with the Sky riders but of course he had run out of power after a long day in the break. Hence, it was evident that it was now a battle between Hermans and Craddock who fought hard to maintain his advantage. However, Hermans was riding a lot faster and with 3km to go, he made the catch. It happened on a small hill and as Hermans sprinted past the American, Craddock didn’t even try to follow him. From there the Belgian time trialled his way to a big solo victory. Craddock was passed by the peloton which sprinted for the minor positions and the bonus seconds. 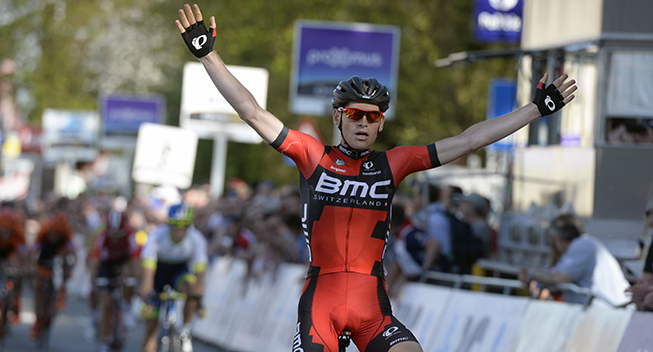 Van Avermaet lived up to his status and beat Julien Simon in the dash to the line to make it a 1-2 for BMC. Nordhaug rolled across the line in sixth and that was enough for him to win the race with an 11-second advantage over Sanchez and Thomas Voeckler (Europcar). The Norwegian also won the points jersey while Edet ended as best climber and Sky won the teams classification. With the inaugural Tour de Yorkshire done and dusted, the Brits have to wait until August before a major race again takes place in the country. RideLondon Classic will again gather a star-studded line-up in the late summer before the Tour of Britain rounds the season off in September. After yesterday’s sprint stage, it was back into the hills for stage 3 of the Tour de Yorkshire. The 167km course brought the riders from Wakefield to Leeds and included many of the hilly roads that were used for stage 2 of the 2014 Tour de France. After a flat start, the riders would tackle two early climbs before a rolling section led to the difficult finale. Here the riders would go up four climbs in quick succession, with the final two ascents coming with 35.5km and 24km to go respectively. From there, there was only a small uncategorized climb before the roads flattened out. The riders had had good condition for the first two stages but when they gathered in Wakefield for the final stage, they had to wear their rain jackets. That didn’t dampen the attacking spirit though and the race got off to a very fast and animated start with lots of attacks. After 6km of racing, no one had managed to escape and the attacking continued for a long time before the elastic finally snapped. When the dust had settled, Sondre Holst Enger (IAM), Lawson Craddock (Giant-Alpecin), Reinardt Janse Van Rensburg (MTN-Qhubeka), Nicolas Edet (Cofidis), Rasmus Quaade (Cult), Ian Bibby (NFTO) and James McLaughlin (Madison) had gone clear. When Bibby won the first KOM sprint, the escapees had an advantage of 3.40 and at the 40km mark, they had extended it by 5 seconds. At the top of the Scapegoat climb after 55km of racing, Bibby was again fastest and the gap had gone out to 4.50. This was the signal for Sky to up the pace. Their efforts paid off and at the 62km mark, they had reduced the deficit to 4.10. For a long time, Nathan Earle and Ian Boswell worked hard to keep the gap stable between the 4- and 5-minute marks. Bibby was again the fastest at the top of the third climb. However, the riders had now entered the hilly finale and this meant that the stronger riders could make the difference. Edet and Craddock managed to escape and despite a solid cooperation between the five chasers, they constantly lost ground. With 50km to go, the gap was still 4.50 and now Europcar decided to make the race hard. Going up the fourth climb, they set a fast pace which sent several riders out the back door. After they had crested the summit, they again left it to Sky to control the race and Boswell was working well to keep the gap around 4.30. Inside the final 45km, Boswell upped the pace and the gap started to come down. This spelled the end for the chasers who were brought back with 38km to go. Just before the catch was made, Enger took off and he managed to extend his freedom until he hit the bottom of the penultimate climb with 35km to go. At this point, the gap was still 3.40 but now it was time for BMC to kick into action. While Edet led Craddock over the top, Joey Rosskopf (BMC) came to the fore to set a fast pace that significantly whittled the peloton down. However, he couldn’t prevent Joshua Edmondson (Great Britain) from attacking and the strong Brit managed to build a solid advantage over the diminished peloton. Meanwhile, the gap was coming down quickly and with 30km to go, it was only 2.30. BMC were in no mood to slow down and when they hit the bottom of the final 3.1km climb, Rosskopf was still riding strongly on the front. With 27km to go, he brought Edmondson back while rain started to fall and the gap had come down to 2.00. As they started to climb, Sky hit the front with Philip Deignan who passed the fading Rosskopf and made the peloton explode. By doing so, he prevented anyone from attacking and he could lead a 17-rider group over the top 1.10 after Edet had taken maximum points. David Lopez took over the pace-setting for Sky but he could not prevent Gustav Erik Larsson (Cult) from launching an attack on the descent. The Swede took a lot of risks and nearly went down in a wet corner but managed to stay upright. Edmondson was not done for today and he decided to launch an attack, trying to join Larsson. Meanwhile, the front duo hit the small climb to the final intermediate sprint with an advantage of 1.00. The climb included slopes of 19% and this was enough for Craddock to make a difference. The American dropped Edet and won the intermediate sprint as the lone leader of the race. Meanwhile, Lopez was riding hard in the peloton and he managed to bring Edmondson back. As they approached the summit, Sanchez and Nordhaug sprinted for the final bonus second and they managed to pass Larsson just before the line, with the Nowegian taking the win. Sanchez tried to launch an immediate counterattack but was closely marked by Nordhaug and instead Stephen Cummings (MTN-Qhubeka) took his chance. He was joined by Steven Kruijswijk (LottoNL-Jumbo) and those two riders got a small gap before Lopez went back to work. Cummings and Kruijswijk caught Edet but they were unable to hold off Lopez who brought the trio back with 12km to go. A Cofidis rider launched an immediate counterattack but it was Ben Hermans (BMC) who flew past the fading Frenchman to quickly get a big advantage. Craddock entered the final 10km with an advantage of 35 seconds and he did an impressive performance to hold off the peloton. With 8km to go, he was still 30 seconds ahead and now Cofidis started to work with Sky in the peloton. However, Hermans was riding faster than anyone else and at this point he had reduced his deficit to just 15 seconds. 2km later he made the junction at a point when the gap was still 25 seconds. Craddock was completely empty and as Hermans sprinted past him on a small climb, he didn’t even try to follow him. At this point, Cofidis had stopped their work and Lopez and Deignan were the only riders riding on the front.